I am fascinated with herringbone stitch - it is so versatile.It serves you well as a filling stitch. 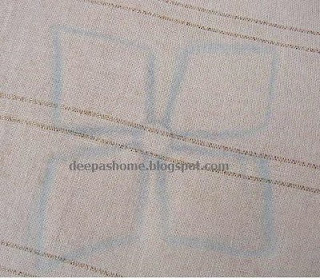 This was one of the patterns I embroidered on my bedlinen. In India, herringbone stitch is an integral part of embroidery - especially kutch work. You can do shadow work too with herringbone. This is the front and back of a shadow worked flower. If you want to see what more you can do with herringbone stitch just visit Sharon's TAST !! Those flowers are gorgeous! My mom used to do so much of embroidery, wish I had learned it from her! Your herringbone examples are really good Deepa, I love the flowers. I love the way you have incorporated the sequins, and your flowers are beautiful, too. oh ! your flower are lovely ! Hi Deepa... I like your flowers, they are beautiful and their color as well.I do a lot of embroidery but I do not use that stitch very often.Thanks for showing it. Thanks. It's full of ideas!!! They are all beautiful, Deepa. I am so happy to have found your blog. Your work is lovely and I've become a "follower." I look forward to seeing more of your wonderful stitching.